“There’s something seriously wrong with that animal. Once again a movie about the fact that playing for God could cause some life-threatening situations. Do you remember the film “Pet Sematary“? And also “The other side of the door” showed that it’s not a good idea to resurrect a deceased person in a non-everyday way. 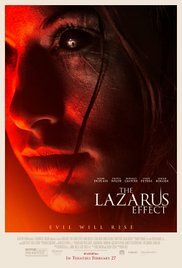 The same happens to Frank (Mark Duplass) and Zoë (Olivia Wilde) in this inferior Scifi / Horror. Zoë has developed a serum called “The Lazarus serum”, to give health care professionals more time to do their work. By means of this serum, it should be possible to bring deceased patients back to life. During an experiment on a dead dog it turns out that not only the animal is walking around and wagging his tail again, but also the cataract he had is cured. They realize that they have manufactured something revolutionary. Of course, you can predict what’s going to happen. They’ll be using the serum to bring someone back to life. In this case it’ll be Zoë, who’s being electrocuted by an unfortunate incident. But don’t be sad. Frank doesn’t hesitate to inject this revolutionary stuff into Zoë’s brain. And before they know it, they end up with a non-human female person, whose brain is developing at a fast pace, giving her all kind of demonic and non-human powers. In addition, a youth trauma plays a prominent role as well. And so Zoë starts to develop this irresistible urge to send everyone to the place where she just came from. The afterlife. Where’s the horror in this horror. I have no problem with rehashed concepts. If only the package feels original and new ideas are introduced. And if that’s not the case, at least I expect it to be a bit of a scary and terrifying horror. Unfortunately, it fails on all levels. It certainly isn’t original and there are no new ideas introduced. And you can’t say this movie is horrifying. Not even close. Even Zoë’s carbon black eyes won’t help. I have to admit that the used neurosurgery language was credible. To be honest this was the only complicated part in this fairly trivial story. So despite the scientific drivel and even the attempt to give it a religious touch, this film is just a watered down version of other movies about someone being raised from the dead. The only thing I was very excited about was the way in which Clay (Evan Peeters) and Niko (Donald Glover) were send to the eternal hunting grounds. But that’s not enough to make it a fascinating film. Clay had better read “Pet Semetary” instead of “Cujo“. He certainly would have protested against Zoe’s ressurection. Or at least get the hell out of there. But on the other hand this movie wouldn’t be the same anymore. Yet one positive feature. The film only takes 90 minutes.